This started as an experiment with an oldy-but-goody stitch pattern. 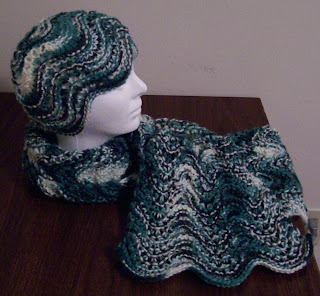 A feather and fan scarf? That's easy! But what about a matching hat? How would you work the crown shaping, you ask? Carefully. 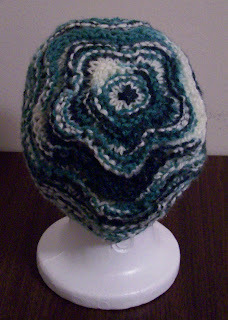 I went through several bouts of knitting and frogging before arriving at a solution. And it even creates a cute flower/star pattern on top. CO 90 sts on circ. Join to work in the rnd, being careful not to twist. Rnd 5: *k2tog 3 times, (k1, yo) 6 times, k2tog 3 times*; rep between *s around. Rnd 8: *p2tog 3 times, (p1, yo) 6 times, p2tog 3 times*; rep between *s around. Rep Rnds 4-9 twice more. Rnd 2: *k2tog 3 times, k1, (k1, yo) 4 times, k1, k2tog 3 times*; rep between *s around - 80 sts. Rnd 5: *p2tog 3 times, (p1, yo) 4 times, p2tog 3 times*; rep between *s around - 70 sts. Rnd 8: *k2tog 2 times, k2, (k1, yo) 2 times, k2, k2tog 2 times*; rep between *s around - 60 sts. Rnd 11: *p2tog 2 times, p1, (p1, yo) 2 times, p1, p2tog 2 times*; rep between *s around - 50 sts. Rnd 14: *k2tog 2 times, (k1, yo) 2 times, k2tog 2 times*; rep between *s around - 40 sts. Rnd 17: p2tog around – 20 sts. Rnd 19: k2tog around – 10 sts. Rnd 21: k2tog around – 5 sts. Cut tail and thread through rem sts. Pull tight and tie off. Weave in ends. CO 56 on circ (or straight). Row 5: sl1, *k2tog 3 times, (k1, yo) 6 times, k2tog 3 times*; rep between *s to last st, k1. Rep Rows 3-5 to desired length, ending with Row 5. Purl 4 rows. BO all sts. Weave in ends.